The intersection of Cobblestone Drive and Carson Farms Boulevard, where stop signs will be installed. 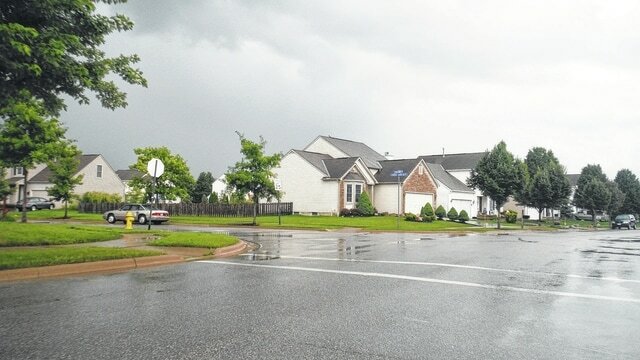 City Council recently voted to install all-way stop signs on Cobblestone Drive at Carson Farms Boulevard, as well as to establish no parking zones on the northeast and southwest corners of the intersection. To let people know about the new stop signs, there will be two yellow caution signs placed ahead of them in both directions on Cobblestone. One says “New Intersection Operation,” while the other has a stop sign and an arrow above it. The existing stop signs at Cobblestone and Carson Farms, which becomes Hayfield Drive, will have an “All Way” sign posted underneath. The vote was 4-2, with Carolyn Kay Riggle, Andrew Brush, Chris Jones and Lisa Keller voting in favor; with Joe DiGenova and George Hellinger voting against it. Kent Shafer was absent. The June 22 legislation formalized the action for permanent enforcement. Council had also taken up the matter on June 8, when it approved suspending the city’s policy of getting positive support of 75 percent of area residents before proceeding. However, it was noted that it had been hard to get that amount of support by filling out a survey, particularly if not all residents own the property they live on. City Engineer William Ferrigno said the past policy of using only a survey was antiquated in the age of social media. The city’s Parking & Safety Committee, which Shafer chairs, is expected to modify its policy of considering requests for traffic calming installations in August. The ordinance also calls for the removal of three street trees. The city’s Shade Tree Commission discussed the matter at its June 23 meeting. “Removing trees on the corner will make it a lot safer,” said city arborist Doug Richmond. Chairman Dave Carey agreed. “I don’t want people cursing trees,” he said.